Self belief? Only for the big achievers? Think again. Everyone has a self-confidence and self-image problem. Everybody!! At first I didn’t really believe that but as I got talking with people, everyone has got a secret, everyone has got stuff that they have done and they keep judging themselves and keep paying the price for things that happened years ago. I realised that I had a self-image problem. What was interesting was that no- one on the outside would believe that. You see what others saw on the outside was not consistent with what was on the inside. When I started to do the work on myself I found that the self-image paradigm was really controlling all the outcomes in my life. My internal self-image was really dictating everything that I did. I could not deviate from the pattern until I changed what I believed about myself on the inside. That was a huge wake up call for me and ever since then I have been teaching and sharing this. 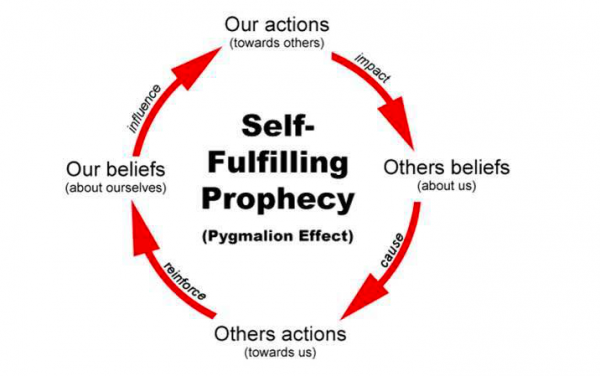 There is a thing called the Pygmalion effect. Its worth going onto google and looking it up –You will find a video about a person called Rosenthal.https://www.youtube.com/watch?v=EjbL7zW-Wig. He conducted this experiment. He selected a group of young school children and some teachers. And he said to the group of teachers “ These children are really showing some tremendous promise and we have picked you to teach them next year”. The teachers taught those children and the results were incredible. What happened? It turns out that there was nothing special about the children or the teachers. They were both randomly picked. But the children excelled in their studies. What happened is explained in the picture included here. Start out on the left hand side. Our beliefs about ourselves influence our actions towards others and then our actions towards others impact peoples beliefs , others beliefs about us which then cause them to take actions towards us which reinforces the belief about ourselves . This is the Self fulfilling prophecy.